"This recipe was handed down to me from my mother. It's easy to make and the ingredients are probably already in your kitchen. Enjoy!" In a large bowl, cream together the butter and sugar until light and fluffy. Stir in the eggs one at a time, beating well with each addition, then stir in the vanilla. In a separate bowl, stir together baking mix and cornmeal. Blend this mixture into the butter/egg mixture, alternately with the milk; stir just until combined. Spoon batter into prepared muffin cups. A little too sweet for this Southern girl, but the kids devoured them. WOW! I have been looking for a corbread recipe that is softer and more cake-like than most. This is it. Thanks for the great recipe! Very easy to follow and very good results. The recipe says it makes 12 muffins and I came out with just 6 med. size so perhaps 12 is a typo?? 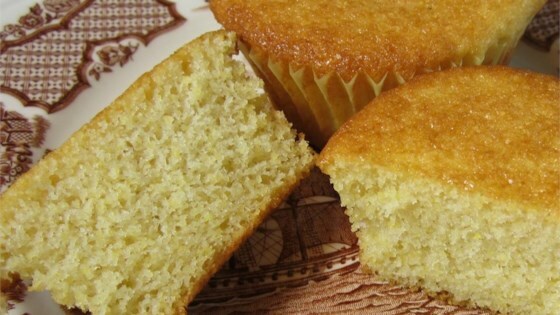 This recipe does not cut it as a "corn" muffin. However it makes the best ever cupcakes by adjusting the sugar to 2/3 cup. I got 12 small cupcakes.